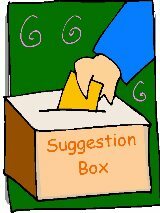 If you have ideas for growth of Swift Presbyterian Church and other service opportunities that you would like to share, please leave them here here. Please pray over this first, and then list what comes to mind. We hope you will list several things. Church leaders want to know what you think. In what ways is God leading me to get involved?